Are you ramped for space? The SMI Pacific Series Wood 4 Post Table will fit where it can to provide your students, designers, or architects with a spacious adjustable angle work top. 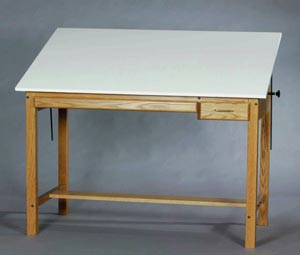 SMI Pacific Series Wood 4 Post Table The naturally rugged solid oak One Top SMI Pacific Series Wood 4 Post Table makes use of stabilizing thru bolt construction to provide any classroom or design studio with years and years of use. The thermally fused white melamine table surface and four solid wood posts combine to give you a smooth, always stable surface on which to draw, design, or work on a blueprint. Add to that, a functional rod mechanism that adjusts the work surface to any angle you desire; an 18-3/4 in. x 5-1/2 in. x 2-1/4 in. locking drawer to securely store your pens, brushes, or tools; and a matching oak tray for your pencils, and you have the affordable compact solution to your desperate space problem. This beautifully designed table comes finished with four protective layers of furniture-grade lacquer. The solid oak One Top SMI Pacific Series Wood 4 Post Table comes with a smooth surface dust cover for storage and measures 24 in x 36 in x 30 in. Made-To-Order: Please allow 3 to 4 weeks for delivery. An Oversize shipping charge of $105.95 will be applied.